Appointed concertmaster of the Rochester Philharmonic Orchestra 2005 at age twenty-four, Juliana Athayde became the youngest person to hold the position since the orchestra’s inception in 1922. She has appeared as guest concertmaster for the Houston and Kansas City Symphonies as well as the National Arts Center Orchestra in Ottawa, Ontario. Prior to joining the RPO, Ms. Athayde was concertmaster of the Canton (OH) and Plymouth (MI) Symphonies. In 2002, she served as concertmaster of the New York String Seminar under the direction of Jaime Laredo for concerts at Carnegie Hall. For five years, she was a member of the Iris Chamber Orchestra in Memphis and she has performed with The Cleveland Orchestra in the United States and Europe. A fellow at the Aspen Music Festival and School for six years, Ms. Athayde was awarded the prestigious Dorothy DeLay fellowship in 2005 and was subsequently invited to return in 2010 to deliver the festival’s convocation speech. 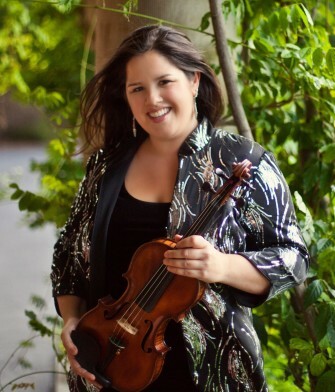 A passionate educator, Ms. Athayde is an Associate Professor of Violin at the Eastman School of Music, and has served as a Visiting Teacher at the Cleveland Institute of Music and a Visiting Professor at Cornell University. She began her studies at the age of two in the Suzuki method and continues that tradition by teaching annually for the Hawaii Suzuki Association and frequently at the Advanced Suzuki Workshop at Stanford University. Her principal teachers are Dorothy Lee, Zoya Leybin, Paul Kantor and William Preucil. Named a Distinguished Member of Sigma Alpha Iota and chosen to receive the 2012 University of Michigan School of Music, Theatre & Dance Emerging Artist Alumni Award, Ms. Athayde was also presented with the Albert A. Stanley Award, the school’s highest honor awarded to just one graduating senior, upon her graduation from the University of Michigan with Paul Kantor (B.M. ‘02). Completing her graduate work at the Cleveland Institute of Music with Cleveland Orchestra Concertmaster William Preucil (M.M. ’04 and A.D. ‘05), she is the first graduate of CIM’s Concertmaster Academy. She spends her summers performing alongside her husband at San Diego’s Mainly Mozart Festival and the Sun Valley Summer Symphony in Idaho. Ms. Athayde performs on a 1948 Celeste Farotte violin and a Hill bow.